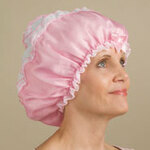 Our satiny sleep cap keeps hairstyles in place – even if you toss and turn all night! Generous size adjusts with a sliding ring to fit any hairdo, from bob to bouffant. This sleeping cap has an elastic, nonbinding edge. Static-free satiny lining keeps hair fresh when you awaken! Imported. Chiffon wind scarf protects your hairdo from inclement weather. 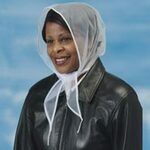 White head scarf folds to fit in purse or glove box. Imported. …dresses and shirts, while adding modesty to low-cut necklines and covering arms for extra warmth. * Light, breathable lace cami. * Comfortable elastic waist and cuffs. * Specify size: M (8–10), L (12–14), XL (16–18), 2XL (20–22). * Women's top made with 95% nylon/5% elastane. * Hand wash; line dry. …toe half socks will keep the front of your foot dry and comfortable in clogs, slides or mules. Back of foot stays bare for slingback, backless styles. Gentle elastic; 75% white cotton/25% nylon blend. Machine wash. 2 pairs of half socks per package. 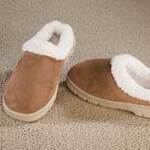 One size fits most (women’s shoe sizes 5 to 10½). …for sleeping or relaxing as it surrounds you with plush, tufted fleece in pretty lavender. Button front makes dressing easy, with a folding collar, patch pockets and long sleeves to keep you toasty. * 6 sizes: M, L, XL, 1X, 2X, 3X. 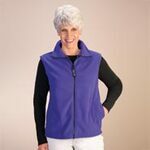 * Women's bed jacket made with 100% polyester. * Machine wash cold.